This is part four of a multi-part series setting up a pulley system for heavy kiln lids. Click here to go to part one. 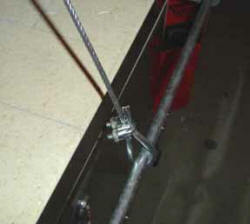 Securing rope to the handle is fairly easy. It only requires that the rope be tied in place, using any basic knot that won't slip. A standard "Figure 8 knot," commonly used in mountain climbing, is easy to tie and strong enough to work well for this purpose. Click here for a demonstration of how to tie a "Figure 8 knot". You can also loop the rope through the kiln handle and secure it to itself closer to the pulley, as was done with the rope in the top photo on yesterday's tip. Kiln lids with two handles instead of one are a bit more complicated. Securing wire to this kind of handle will be discussed in detail in the step-by-step example coming later in this series. Click here for the next part of this tip, which deals with the use of counterweights and methods of securing the other end of the rope or wire, which is used to hold the lid open once the pulley does its job.